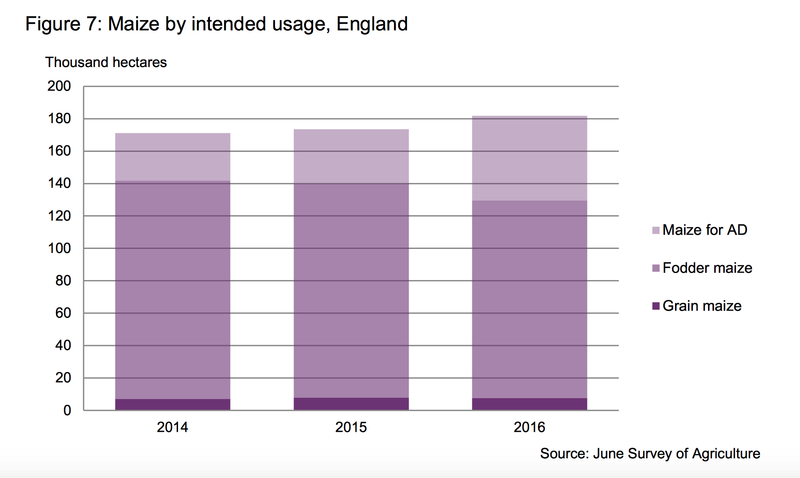 Figures just release by Defra (see here) show that the area of land in England used to grow maize for use in Anaerobic Digestion plants to produce electricity rose to 52,280 ha – a 55% increase on 2105. 29% of all maize grown in England now is for AD plants. This accounts for 1% of all arable land in England. 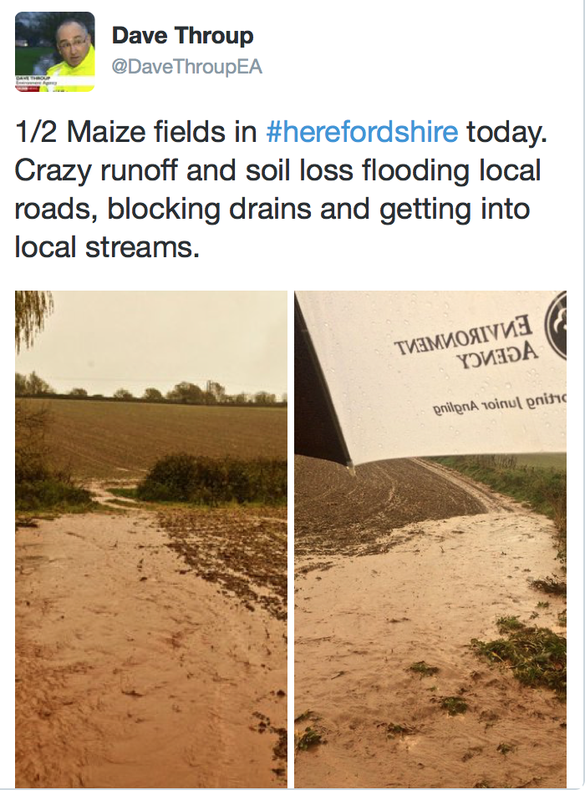 As I, and many others, have repeatedly said maize can be implicated with increased flood risk (see here and here for my collection of blogs on the topic). Maize is harvested late in the year and the heavily compacted soils are left bare all winter. During periods of high rainfall these soils do not absorb the water to any great extent – instead the water rushes off the fields, particularly when they are on slopes and quickly overwhelms stream and river systems. When this happens extensive soil erosion can also occur. Prior to its abolition earlier this summer, following Theresa May’s appointment as Prime Minister, the Department for Energy and Climate Change had issued a consultation paper which included two options to reduce the incentives for farmers to grow maize for AD – see here. I haven’t heard the outcome of that consultation and I’m not sure which government Department is now responsible for it – Defra maybe? Does anyone else know? The 55% increase in maize grown for AD announced today would not have been influenced by the DECC consultation as the seeds would have been already sown. 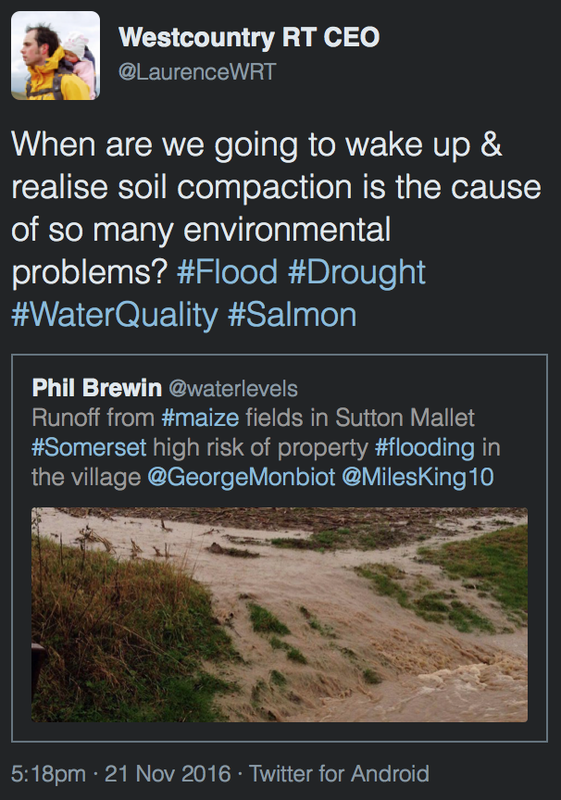 It would however be helpful if an announcement is made soon as it would potentially influence sowing intentions next spring and I don’t think anyone (other than the maize farmers concerned) want to see a further increase in the area of maize grown in England with its attendant increased flood risk and heightened soil erosion potential. 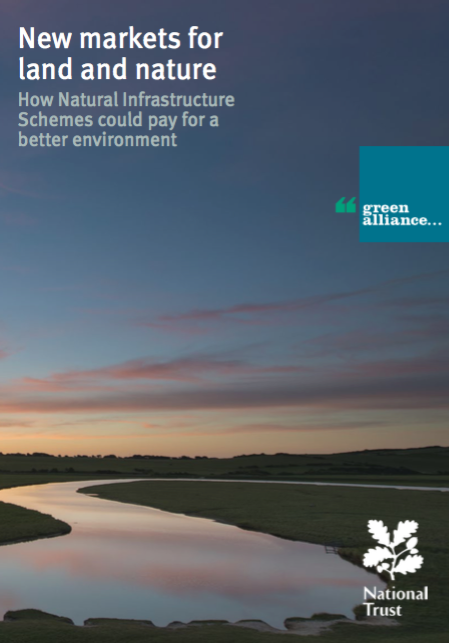 The Green Alliance has just published a new report – Smarter Flood Risk Management in England – investing in resilient catchments by Nicola Wheeler, Angela Francis and Anisha George. You can download it here. Here is the BBC reporting of the study – see here. 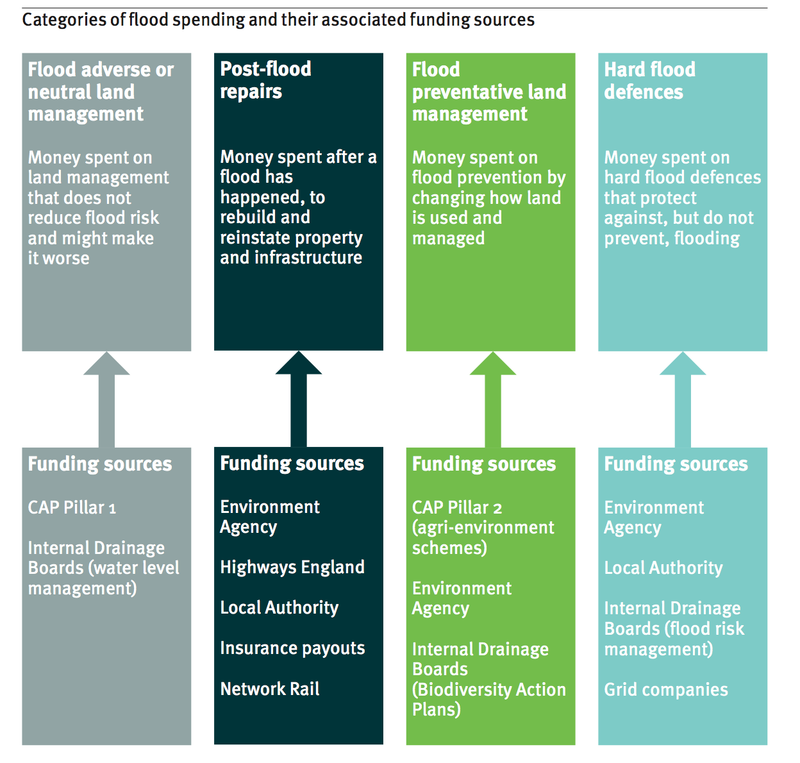 The Report suggests that 4x as much money is spent on land management that ignores flood risk compare to that which prevents it. 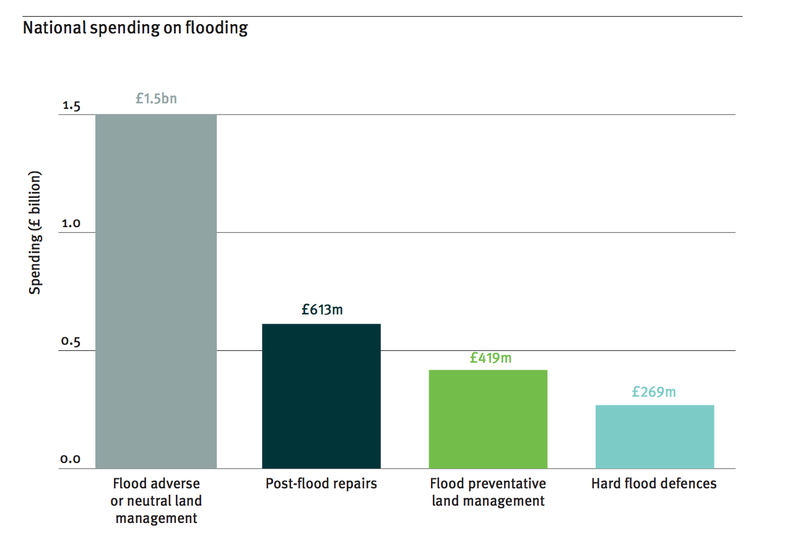 In addition 2x as much is spent on the aftermath of floods as is spent on flood defences. The Green Alliance is calling for s reform of the CAP post Brexit which takes flooding into account, the establishment of a Natural Flood Management budget (in addition to the £15m that has already been pledged and the creation of Regional Catchment Boards which seems to reflect the views of the Environment, Food and Rural Affairs selection committee (see here) and Dieter Helm’s views (the Chair of the Natural Capital Committee (same blog – see here). These graphics are included in the report and detail their case. It is an important report which highlights the policy clashes – let’s see what happens next. 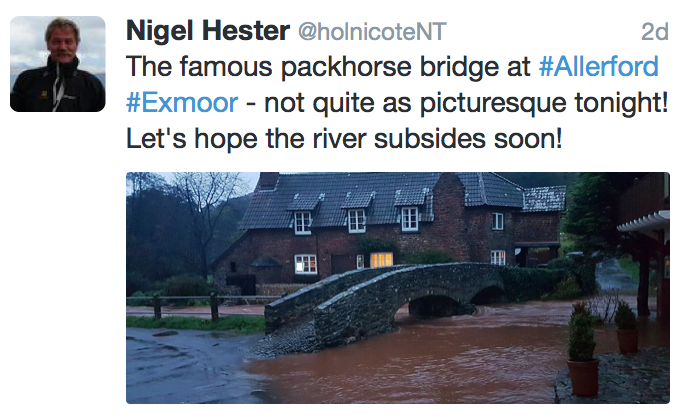 Following Storm Angus last weekend a piece appeared in the Guardian which reported that the Natural Flood Management measures introduced by the National Trust on its Holnicote Estate on Exmoor had been effective at protecting over 100 houses downstream from flooding. 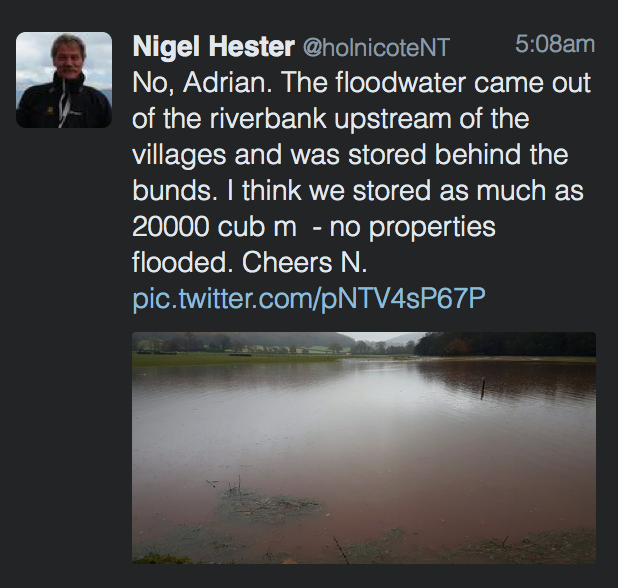 This is his reply – no flooding. 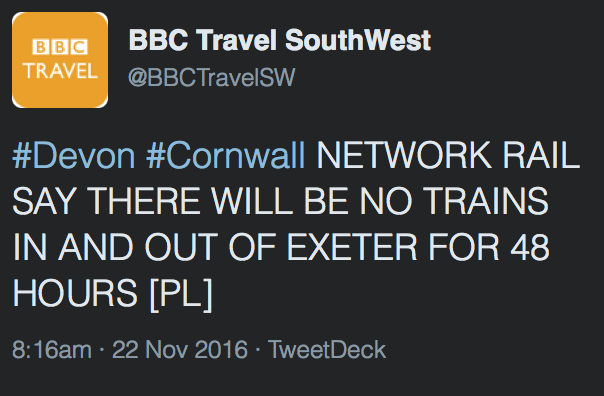 This is very good news and a very impressive outcome considering there were two large flood events in succession. When the Amber rain arrived there was still a lot of water in the system from Angus. This is a major story and one that should be of interest to local communities and politicians everywhere. It appears to me that a well designed and correctly located natural flood management scheme can make a real difference on the ground. Now all that is needed is some modest funding and some political will. Storm Angus and yesterday’s ‘Amber’ rain have taken their toll, flooding is widespread and disruption is extensive. 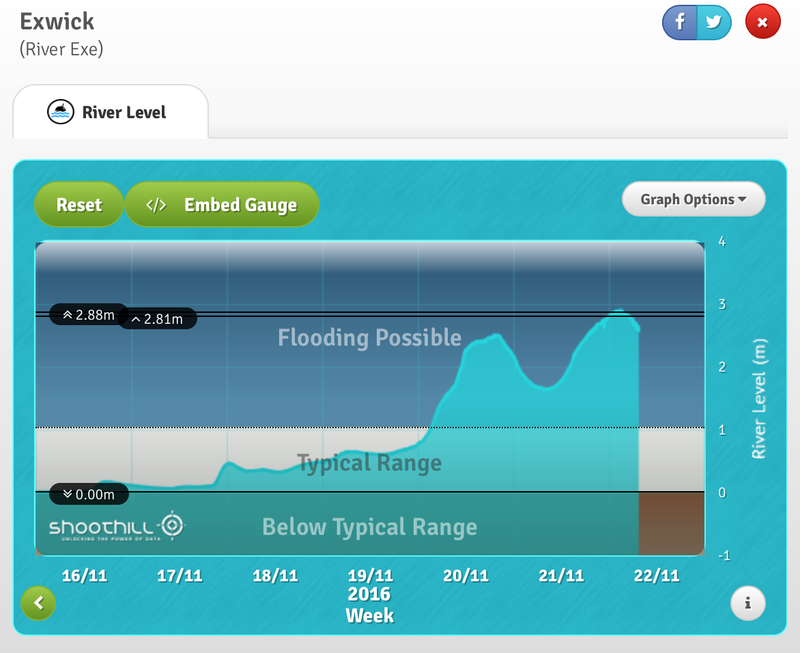 This is the gauging station data from the Exe in Exwick where I live – the first peak (20/11) shows the water levels caused by Storm Angus, the second peak (yesterday) is as a result of the ‘amber’ rain – note this is a new record high. We have undoubtedly had a lot of rain but many of us think the problems have been exacerbated by certain land management practices – I have written extensively about this in the past with particular reference to maize cultivation (see here for all my writing on that topic) and today my Twitter feed is full of other people saying pretty much the same thing. 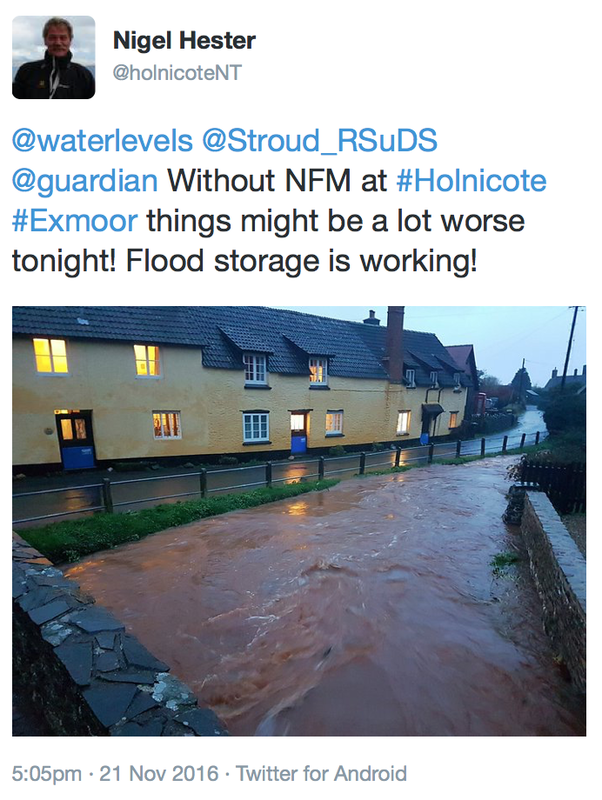 Here is a tweet from an Environment Agency Manager in Herefordshire – look familiar? 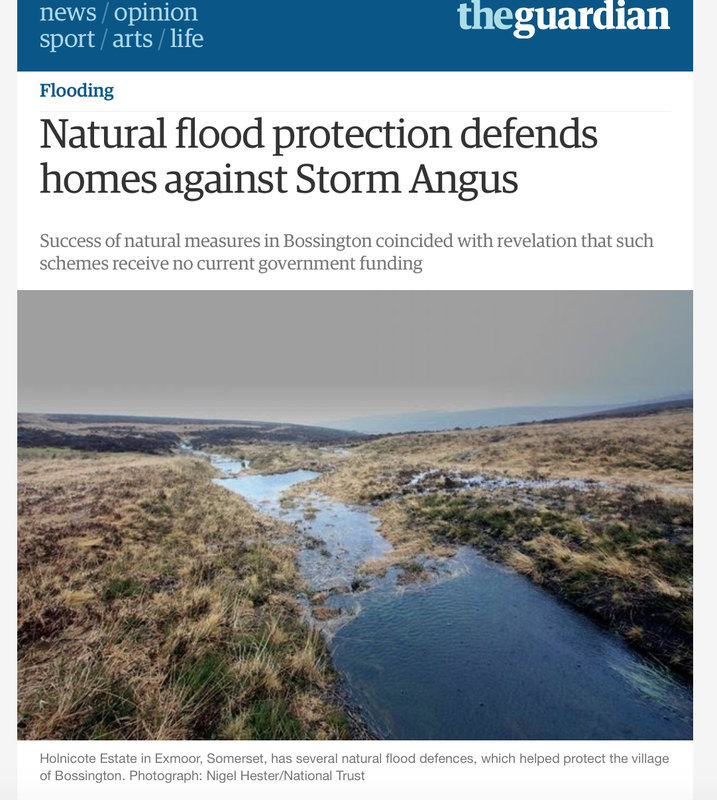 Ironically yesterday the Guardian published a piece which featured Holnicote and stated that the Government is not funding any Natural Flood Management Schemes at present – see here. Lets hope some of these things change soon. Following the winter flooding in 2015/16 characterised by Storms Desmond, Eva and Frank, the Parliamentary Environment, Food and Rural Affairs (EFRA) Select Committee launched an Inquiry into flooding. 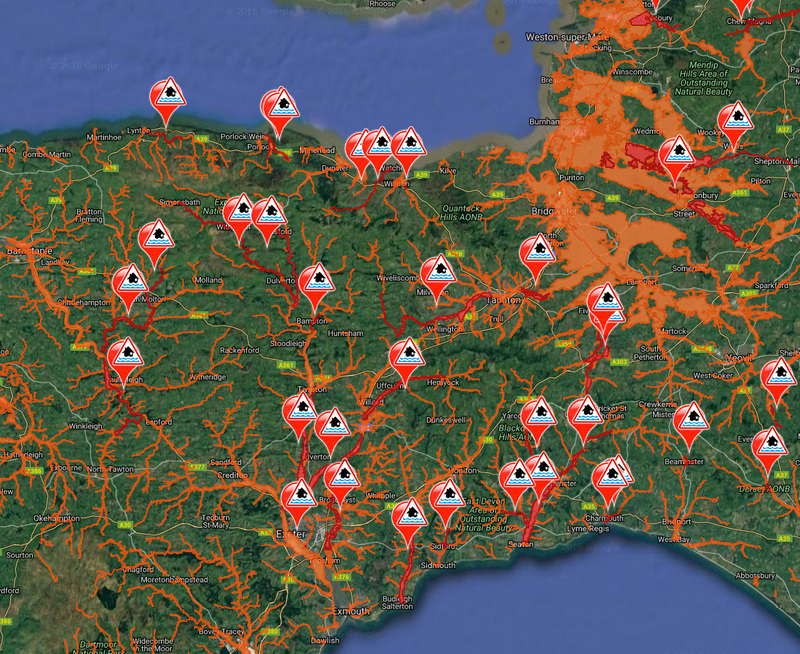 Their report ‘Future Flood Prevention’ was published last week – you can download it here. The report contains a number of recommendations to Government. Whilst Select Committees are advisory and Government are under no obligation to implement the recommendations reports such as this are considered influential in the debate. The EFRA report follows on the back of the Government’s own National Flood Resilience Review (see here) which specifically covered protecting strategic assets such as power stations etc during flood episodes. Of particular interest to me are the sections in the report that relate to catchment wide measures to prevent flooding and natural flood management measures. I have written extensively about this topic – follow this link and you will see the blogs I have produced. 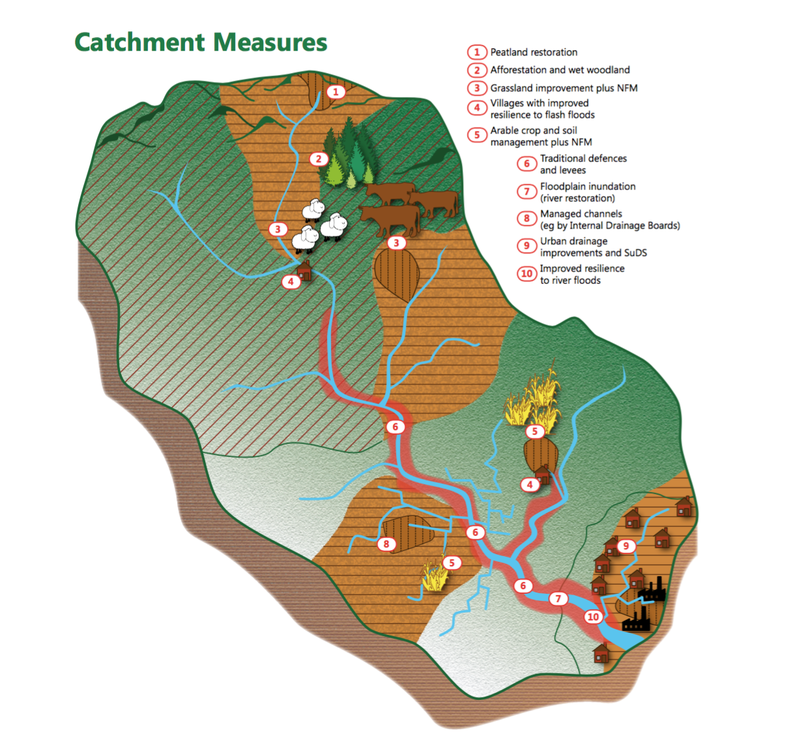 The report contains this graphic produced by Dr Paul Quinn which indicates a range of measures that can and should be taken at a catchment level. There is more research to be conducted on this topic but a number of trial projects are mentioned in the report favourably e.g. Holnicote in Somerset, Pickering’s ‘Slow the Flow’ and the Moors for the Future work in the Peak District and the Pennines. 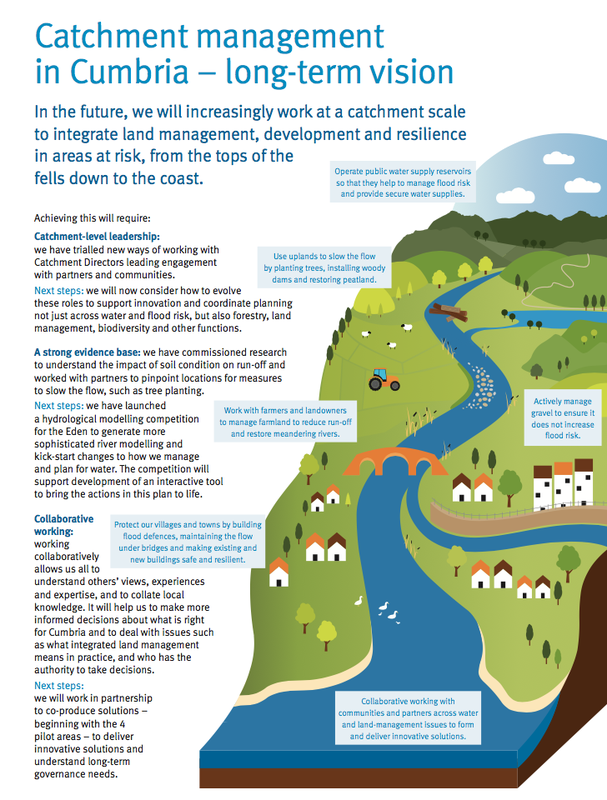 It wasn’t that long ago that natural flood management measures and the need to work on a catchment scale were simply the mantra of a few environmental organisations and academics – it is now seen as a mainstream solution. The second point regarding the use of farmland to store flood water is also significant. 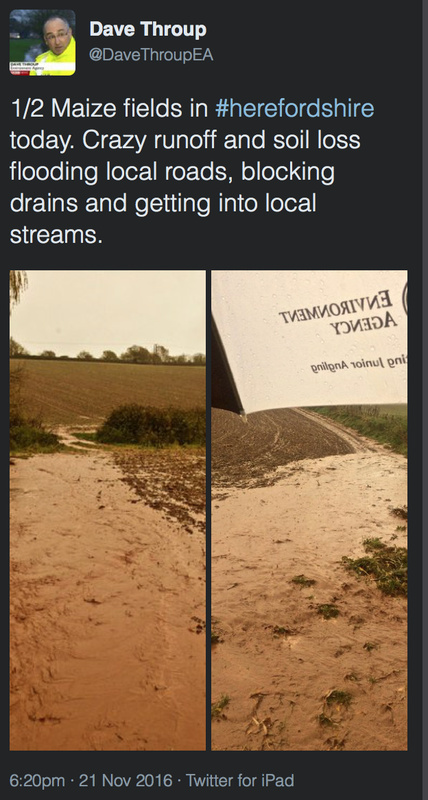 The NFU have long opposed such a move and indeed ‘flood defence’ measures from the 1970s to very recently have been designed to protect farmland from flooding rather than allowing flood plains to flood. 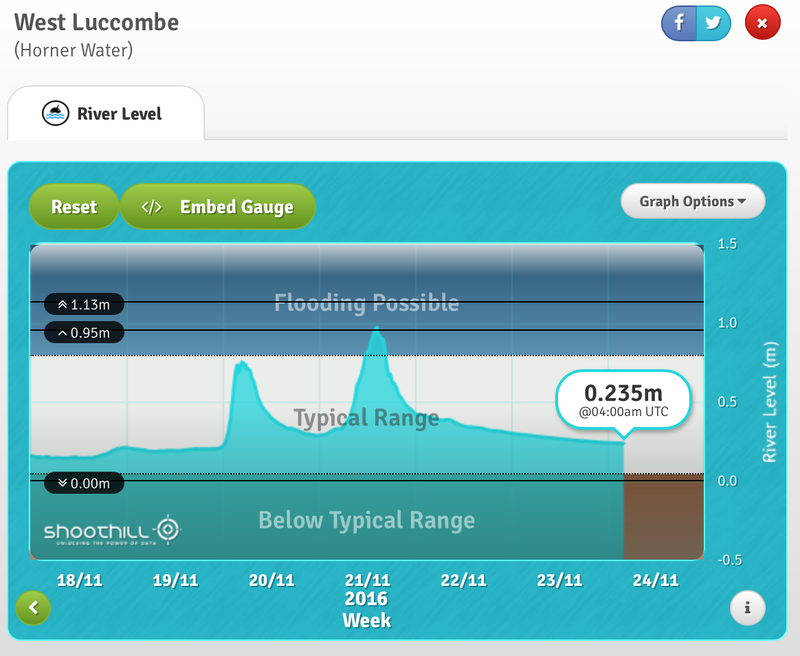 As the recommendation suggests there is still some way to go but there is a clear marker that in some places this needs to happen – better to allow flood water onto farmed flood plains than allow it to rush into people’s homes downstream of the protected farmland. The Report has also tasked the Environment Agency and the Met Office with improving flood risk communication i.e. ‘the 1 in a 100 year flood’ message is confusing to the public and is becoming meaningless in a world where the climate is changing and extreme storm events are increasing. EFRA also call for various measures to be taken around the planning system to improve resilience to flood. For example developers who flout planning requirements should be made liable if flooding subsequently occurs. These ideas are not very different from those proposed by Dieter Helm, the Chair of the Natural Capital Committee – see here. I’m not really sure what I make of these recommendations, on one hand it takes us back to something akin to the old National Rivers Authority which was considered effective and successful, on the other hand though in a world of Brexit and all the upheaval that will ensue I’m not sure that DEFRA will have the capacity and the brainpower available to re-organise the Environment Agency. (DEFRA will be extremely busy working out what follows the Common Agricultural Policy and gaining access to the Single Market for farmers). The CLA aren’t very impressed with these recommendations either calling them a ‘backward step’ – see here. 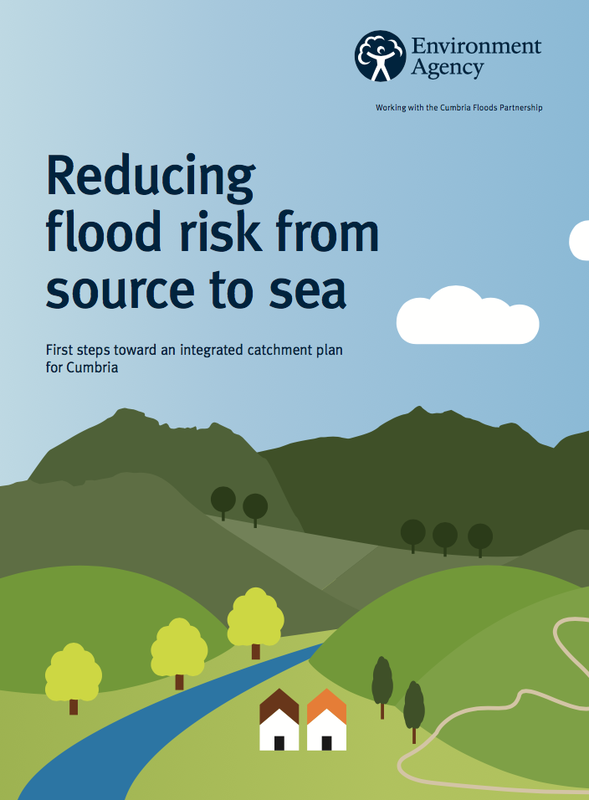 Apart from EA re-organisation proposals the report has been well received by a wide variety of organisations interested in reducing flood risk. Perhaps the most odd press release on the EFRA report comes from the Countryside Alliance which suggests that the report ‘recognised that there is no proven link between grouse shooting and flooding’ – see here. It is an odd statement as nowhere in the report is there a mention of grouse shooting. I have also written recently about the Uplands Alliance meeting in London where options for the future were discussed – see here. Yesterday another approach and contribution was launched, again involving the National Trust but this time in partnership with the Green Alliance ‘New Markets for Land and Nature. How Natural Infrastructure Schemes could pay for a better environment‘. You can download the report here. For the past few years the National Trust have been developing their Land and Nature programme, an attempt to define and expand the Trust’s work in saving, creating and enjoying nature. One of the work streams was exploring new economic models for agriculture. This work carried out by the Green Alliance for the National Trust is the first major contribution to that debate. The report uses an ecosystem service approach and focuses on a market for ‘slow clean water’. They argue that by creating such a market water companies would not need to spend so much on pollution reduction and water treatment measures and bodies such as the Environment Agency, local authorities and insurance companies would not need to spend so much on flood protection schemes along with the costs of clearing up after such events had occurred. 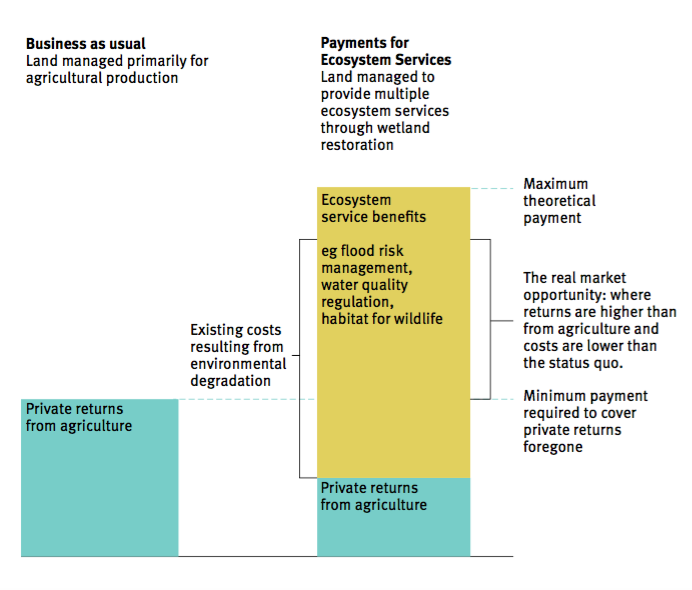 This approach builds on DEFRA’s ecosystem payment model by increasing revenue with ‘a market for avoided costs’. The report suggests that the cost of floods and treatment for water pollution to be £2,373 million a year, equivalent to £24 million a year for each of the one hundred water catchments in England. 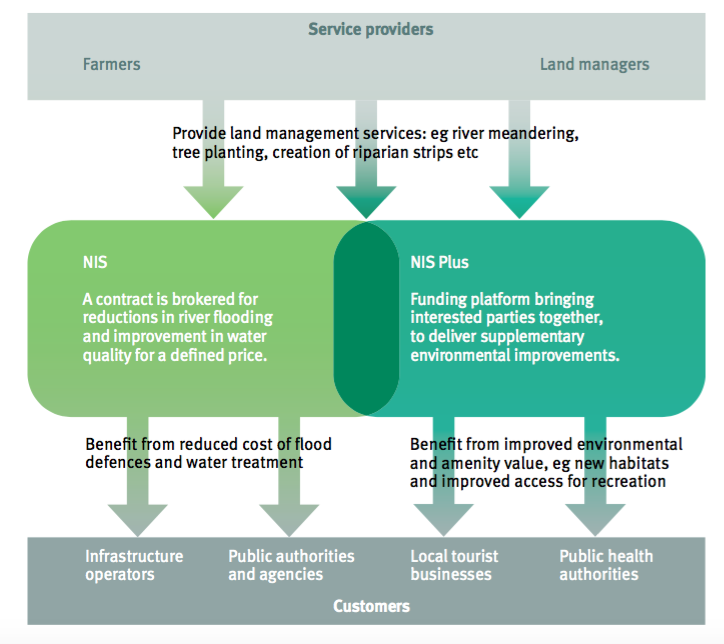 This diagram gives an overview of how Natural Infrastructure Schemes (NIS) and NIS Plus might work – driven by farmers and land managers and funded by industry / public authorities who save money from the avoided costs of pollution and flooding which then benefits a variety of different customers. It is a very interesting contribution to the debate on post Brexit agriculture, the State of Nature, flooding and pollution. It offers a mechanism whereby farmers, especially those in the uplands can secure their financial futures by providing additional ‘public goods’ along with an albeit reduced farming output. It offers the opportunity of giving upland farmers a large, important and publicly valued societal role at a time when their own self esteem has been reduced by an otherwise unprofitable agricultural regime.